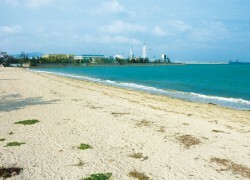 This is a public beach situated on the eastern coast of Okinawa, just next to the Ishikawa Sports Park. From the gazebos built on the beach, you can look out over the large expanse of Kin Bay. Surrounded by lush trees providing some welcome shade, the beach is a popular spot for picnics.